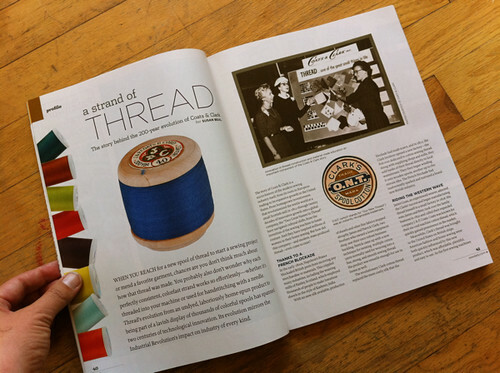 I got my copy of the spring Stitch magazine this week and was so excited to see my article on Japanese fabrics, right there in real life on the page! It’s so colorful, perfect for a February day like today. 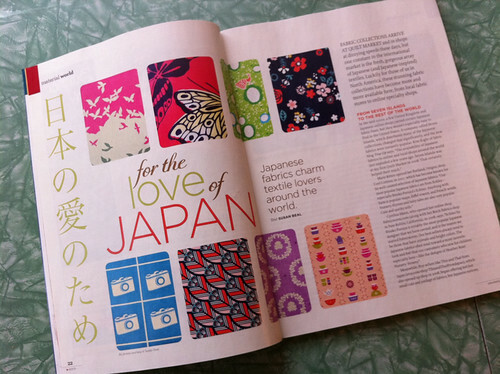 I love Japanese fabric and it was a dream to get to write about it. The whole issue is so pretty! 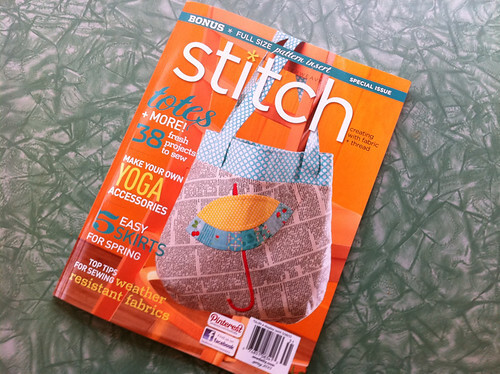 I got to interview some of my fabric industry and sewing heroes for this article – thanks to Mariko of Super Eggplant, Marie of Cool Cottons, Cynthia of Fabricworm, Patricia of Okan Arts, Kim of True Up, and Naomi of Patchwork Quilt Tsushin for their contributions. 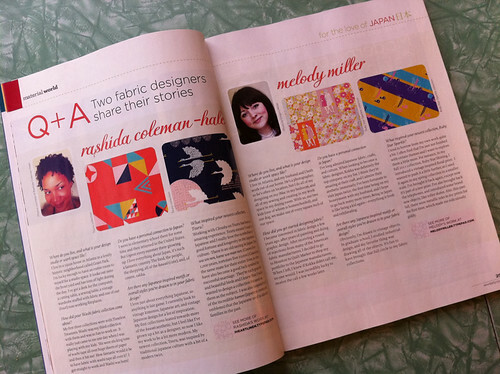 I also got to profile two amazing fabric designers, Rashida Coleman-Hale and Melody Miller. Rashida’s new Tsuru line with Cloud 9 and Melody’s Ruby Star collections for Kokka are both spectacular. They are both American, but their work is gorgeously inspired by Japanese design and culture, and (I think) perfectly reflects what Kim Kight calls the “inventive, cute, oddball and beautiful” qualities of Japanese fabric. 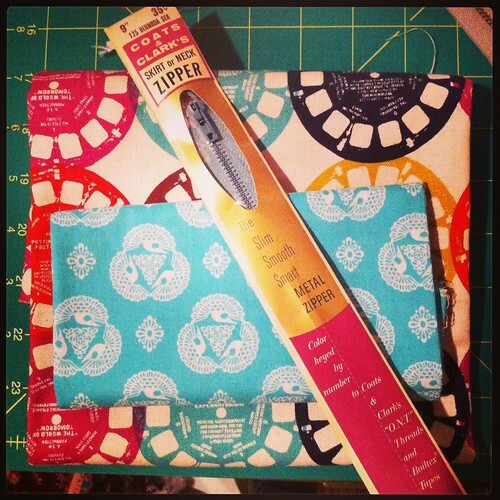 And Stitch excerpted and shared my Block Pocket Apron project from Modern Log Cabin Quilting – plus I got to re-make the pocket using three different combinations of Japanese prints to put a new spin on things! Thank you to Rashida for sending me prints from Tsuru, Fabricworm for sending me Kei and Kokka, and Cool Cottons for helping me with the Echino. I loved working with these fabrics and I hope it inspires lots of small-scale projects like these little pockets. A little goes a long way with these gorgeous prints. Speaking of, I had a little dream project in mind for Quiltcon and was so happy to pull it off this week. I needed a neat little bag to hold my MLCQ book postcards, PMQG business cards, and the new moo cards I ordered (yay!) while I’m at the convention. I knew I wanted to use Melody’s Viewmaster cotton/linen print from Ruby Star Rising, and Rashida’s aqua Tsuru prints were the perfect complement. I found a vintage Coats and Clark zipper in my stash (“Bermuda Sea” blue) to go with it. I signed up for Kristin Link’s free Craftsy class on zip bags and totes, and used her stellar instructions. Her blog post on alternate sizes was also very inspiring. (And check out Amber’s cute version with typewriters!) 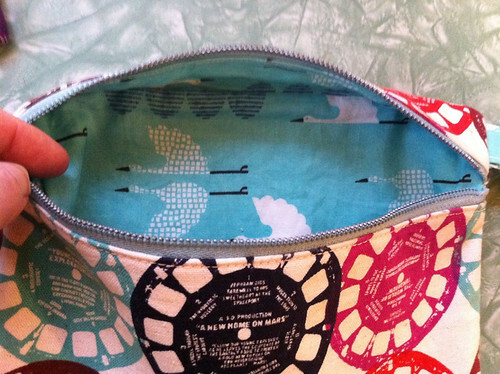 After a little math to adjust the finished size upwards, I had this pretty little bag all stitched up! I am so happy with it!! I wrote about my size adjustments on my Craftsy project page if you’re interested, and added a D ring (as Kristin suggested on her blog) to the tab loop. My friend AnnMarie Cowley of PMQG made the other loop with the Denyse Schmidt dots for another pouch she gave me, but I borrowed it for this one – I love it! Makes it a perfect little clutch purse. And Rashida’s cranes make me happy every time I see them! I have to be honest, I’ve had this Viewmaster print for ages (along with a few others of Melody’s – I love her prints) and have hesitated to cut into it, thinking it was too precious. This little project was the perfect way to use both of these treasures. Now every time I reach for a card at Quiltcon, or want to tuck in someone else’s card to keep it handy, I will enjoy these pretty prints. Speaking of Quiltcon, I wanted to mention that I’m on a panel on Friday at 2:00 on writing for magazines and would love to say hello if you can come to that! Latifah Saafir is moderating, the other panelists are fantastic magazine editors and publishers, and I think it will be a great hour. 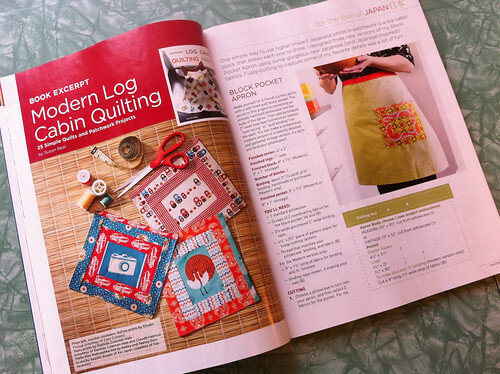 Thank you to the Modern Quilt Guild for including me! I fly to Austin in a week (!!!) and I am so excited. See you then! Nice job on the articles, Susan! 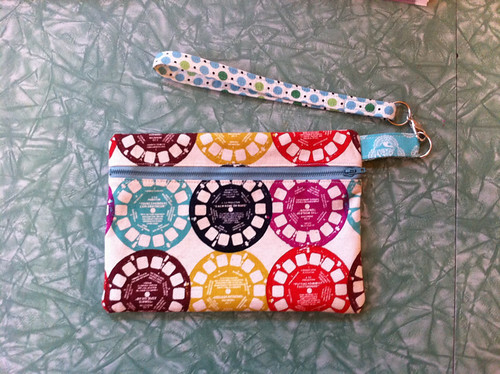 Love your bag, too…that Viewmaster print is so cool, must look for some. Have a great time in Austin. Thank you so much, Suzanne! Hope to see you at the March meeting!! Looks like a great issue — and your article is a must read. Congrats, Susan! I also love your zipbag. I can see why it makes you smile. Have a great time at QuiltCon! Congratulations on getting published!! And I love the bag you made. That’s adorable, and now I really want to make one! Also, I would love to nominate you for the Liebster Award! If you would kindly just confirm that you have 200 subscribers or less, that would be perfect! I will be posting on my blog my nominations within the next 2-3 days. I look forward to hearing from you!